I’ve finally had chance to go through my swag bags and start sorting things out. This has been helped by yesterday’s new drawers which are now all tidy and organised! Those that know me will laugh at that. Me, organised?? My argument is that I can be organised if I have enough time and enough space. And we all know that both of those are in small supply round here. So anyway, I made some space to unpack (and indeed, work). Here are some of the goodies, from a mixture of sources. 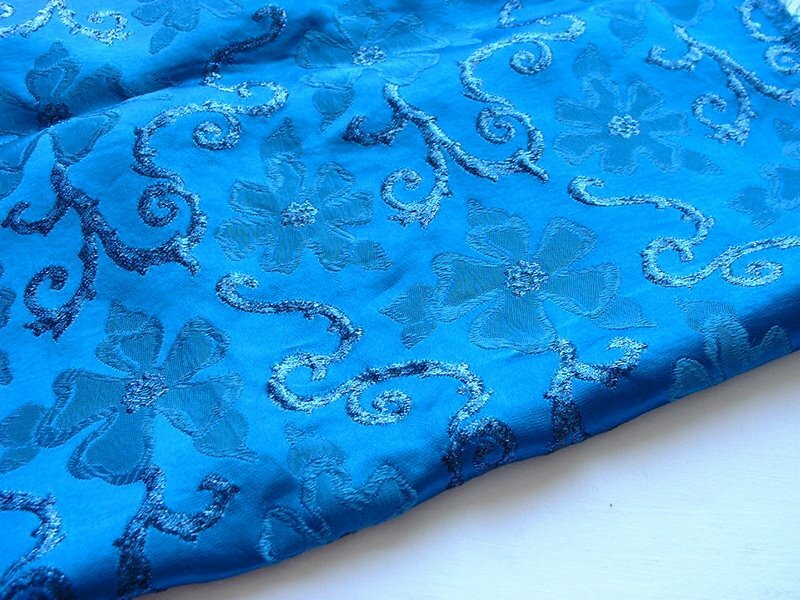 Fabrics first – turquoise brocade scrap piece from some amazing 60s frock I would guess. 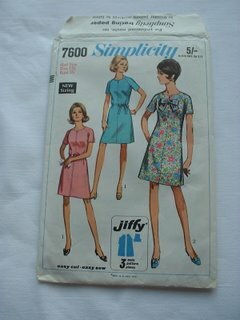 When I was about 16 I had loads of fabulous 60s dresses including one in this kind of colour. I threw loads of clothes out when I went to university. And have continued to do so every time I have moved house since. Which is about 12 times now. Oh, that reminds me, I have lived in this flat for a year. This is remarkable. I may even make it to two years, which I have not done anywhere since I left home. This is not out of choice, it is the joys of renting. 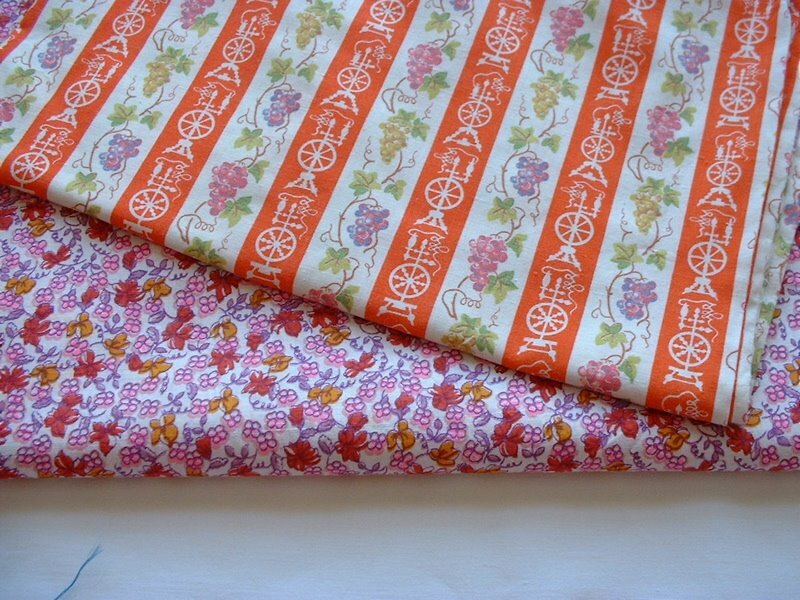 Anyway, back to the fabrics! These two are so pretty. The top stripey one is in fact a large laundry bag, so will stay as that, and replace the one I made when I was 15 which is pink check and rather boring in comparison. The bottom piece is a large cotton print which would make a lovely dress, should I ever find the time to do such a thing…. There was only one pattern in the stash, but it’s a nice one – I like the neckline, so will be adding that to the mountain of patterns. The rest are embroidery designs, mostly, from the late 50s. 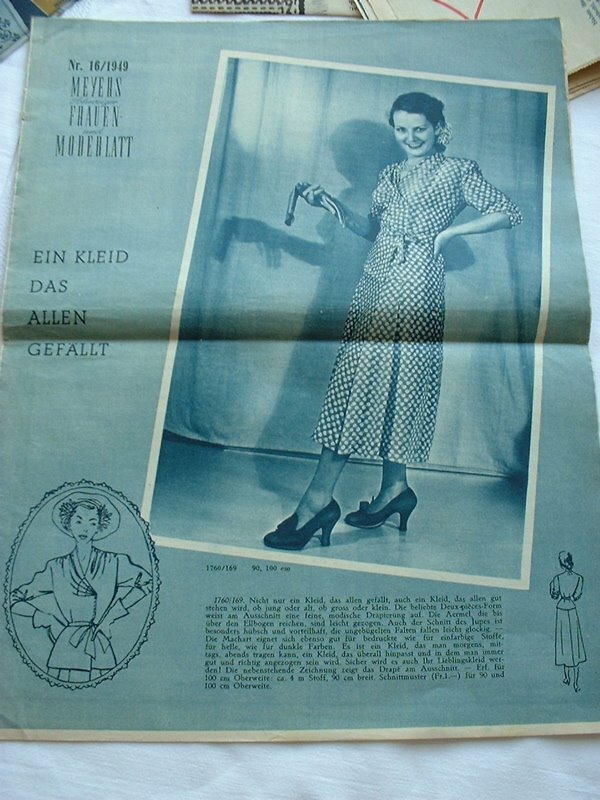 There are a couple of gems of late 40s fashion magazine pages and one Swiss German magazine. 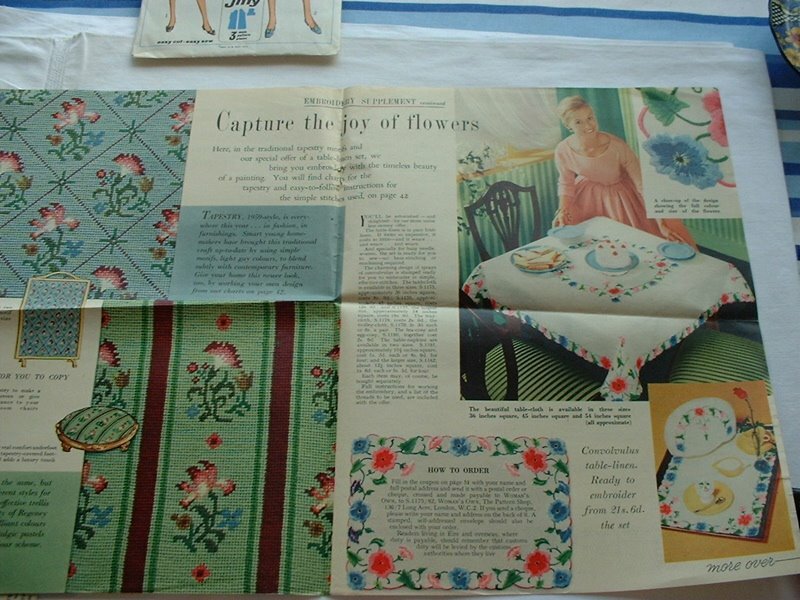 The woman these originally belonged to was Swiss and her son, my friend, has given me all these, along with loads of aprons – yay! and lots of hand-embroidered white cotton sheets. These turn out to be singles, so not sure what to do with them, apart from make them into completely new things. So happy me with lots of new things to play with. I am in the middle of making a pair of trousers for my mum, out of black linen. It’s so nice, I want a pair myself!